Why would there be differences between the keyword timeline and the keyword page? 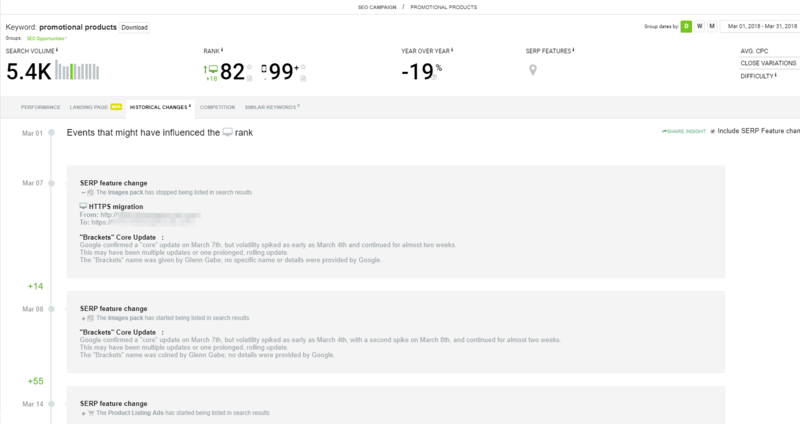 On the keyword page, the graph shows all of the events: rank changes, SERP features changes, landing page switches. The keyword timeline only displays changes that might have affected the ranks and what might have caused them. In both situations, the details displayed are directly related to the period selected in the calendar. On the graph, you can see all of the rank changes that took place during the selected timeframe. However, the insights on what kind of events could have influenced these changes are only available for some of them and on the timeline you only see those particular events.